September 2 , by Stacie Hooder. Jewelry designer Lynn Davis creates “invented vintage and faux-tique” pieces that I find exquisite. 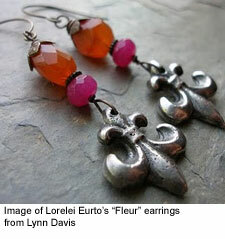 Lynn posted about the lovely earrings made by Lorelei Eurto called “Fleur” featuring Lynn’s very own fleur de lis components. These lovely earrings are available for purchase in Lorelei’s Etsy shop. Lorelei was recently featured in an interview at Lark Crafts. Don’t miss what Lorelei had to say.